Curb bits are used by many western riders, and they have their place in the English and driving world too. Curb bits can be useful for a horse that is a strong puller—for example, one that becomes excited while on the trail or over jumps. Curb bits allow the rider to give much more subtle rein aids than with many snaffles. They encourage a horse to flex and carry their heads on the vertical, like dressage horses, who are ridden in a ​double bridle with both a curb and snaffle bit in their mouths. When riders use a curb bit, they must remember to keep their rein aids much more subtle than when using a snaffle. Because curb bits are leverage bits, your aids are magnified compared to the direct pull that activates a snaffle bit. Using a curb bit means you must keep your hands quiet unless you are using reins aids—your hands and body must move independently. Inadvertently jabbing on your horse's mouth with a curb bit, for example, if you lose your balance and use your reins to hold you up, could be very painful for the horse and cause training problems if it happens often. Curb bits are not generally suitable for starting horses. Most horses will start their careers as riding horses and driving horses in a snaffle. A curb bit works on three points of the horse’s head when the reins are pulled: the mouth, the chin, and the poll. Like a snaffle, there is some pressure placed on the bars of the mouth when the reins are pulled. Depending on the style of the mouthpiece, there may also be action on the tongue and the roof of the mouth. 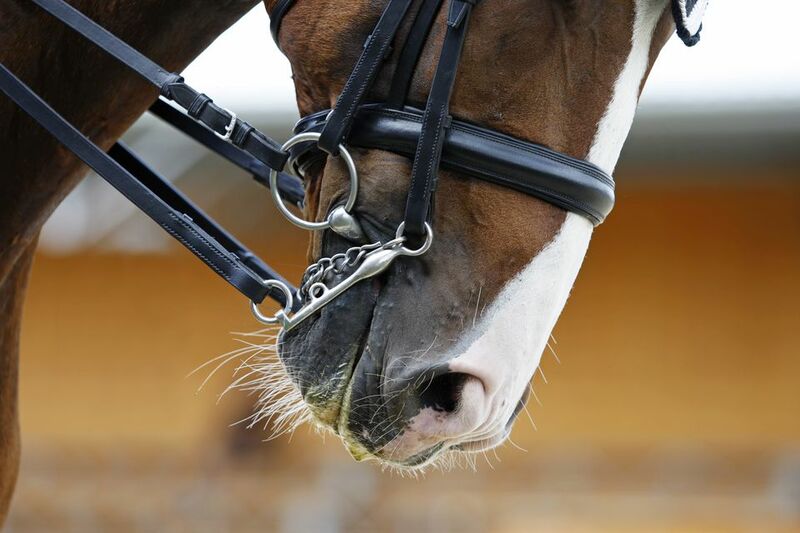 Unlike the action of a snaffle, that only places pressure within the mouth, the shanks of a curb bit act as a lever, pulling down the crown of the bridle, putting pressure over the poll (top of the horse’s head), and pulling the curb chain or strap forward against the horse's chin. The curb strap creates pressure, but it also prevents the bit from rotating too far around in the horse's mouth. This is especially important with ported bits, where the port may rotate harshly against the roof of the horse's mouth. Some (mainly English curbs) may have a lip strap to prevent the horse from chewing at the shank. Some bits will have a strap, wire, or chain that connects the bottom-most rings on the shank, called a hobble, to prevent the shanks from spreading too far or being pulled together. These keep the shanks more stable. Horses ridden western will work with little contact on the horse’s mouth. The reins will appear to be quite slack. The horse will be neck reined and the reins held in one hand. Horses ridden English will often be ridden ‘on contact’ with a rein in each hand. The horses will be trained to respond to variations of pressure. There is a huge variety of styles, both English and western, but the principal actions are the same for both. The cheek pieces, come in many different styles (shanks and purchase) and lengths. The different mouthpieces and cheek pieces affect the action and severity of the bit. Cheeks may be straight or curved, and the shape of the cheek pieces affects the leverage action. The cheek pieces may be solidly attached to the mouthpiece or may swivel. Cheek pieces may be straight, slightly curved, almost half-circular or S-shaped. Some curb bits may have a straight mouthpiece, while other may have ports, keys, rollers or different types of materials and combinations of metals. Ports provide room for the tongue and depending on the design, may act on the horse's palate. Similar to ports are 'spoons' that are solid and act on the roof of the mouth in a more assertive way. Various metals such as copper or sweet iron (rust) are thought to encourage the horse to salivate, resulting in a more responsive mouth. Various synthetic mouthpieces are designed to make the bit more comfortable for the horse. Jointed mouthpieces increase the pressure on the bars of the mouth with a nutcracker action when the reins are used. A common example of this is the Tom Thumb, often erroneously referred to as a snaffle bit. Curb bits can range from very mild, such as the very short shanked kimberwicke (kimblewick), to very severe, such as a high ported long shanked correction bit. The severity, however, is not in the bit itself, but how it is used. In the wrong hands, the mildest snaffle bit or shortest shanked curb can be very severe. Excessive pulling and jabbing can be very painful for the horse, resulting in behaviors like head tossing, rearing, rooting, and balking. Eventually, your horse will become numb to the bit and difficult to control. All bits are artificial aids that we must learn to use correctly to avoid problems.